Join us in celebrating our 50th Anniversary on June 7th. Awards applications are due April 25th. See below for more information on the program. We will be presenting awards to Subcontractors, General Contractors and Architects & Engineers. As a member, your company has the opportunity to compete for honors in the construction industry’s premier annual awards program – the ASA Construction Awards competition – recognizing the outstanding subcontractor projects of the year. Use this and the included forms to enter your company’s best project(s). This submission is an easy 3-page electronic submission; no notebooks need to be created, and you will submit the information electronically. You may enter as many projects as you would like in the appropriate project size category. Projects must be completed by December 31, 2018. All award winners will be recognized at the June 7, 2019 awards celebration. The ceremony will feature a multi-media presentation highlighting the winners through videos about each submitted project, and a printed program highlighting each submission. 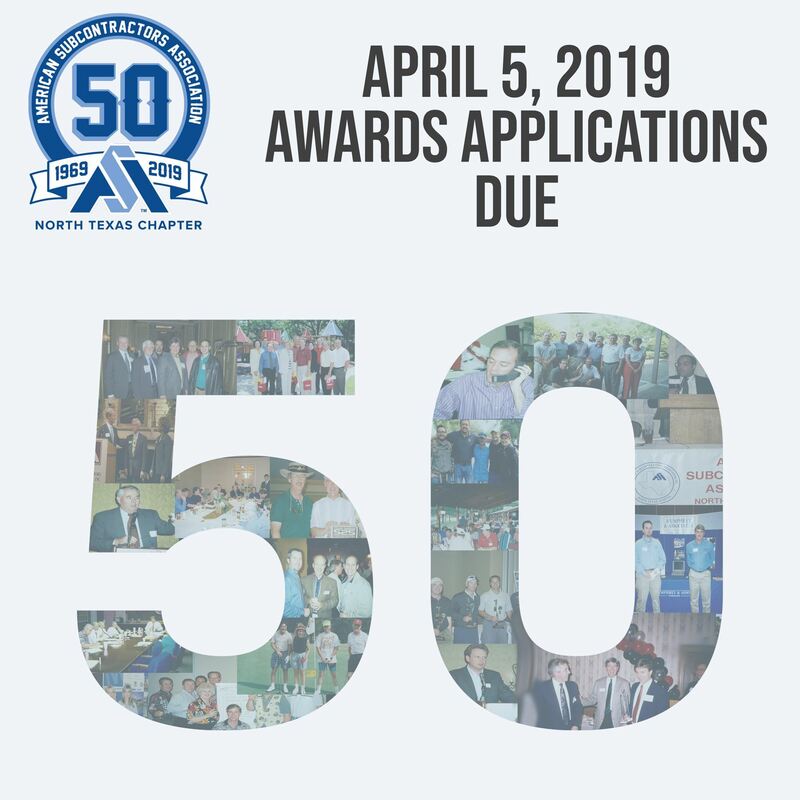 All winners will be recognized by ASA North Texas, Construction News and a press release for Award winners will be distributed to construction-related media outlets. We will provide you the video created from your awards submission after the event. You have all copyright use of this material. Your submissions are judged by two separate groups each comprising of 50% of your score. You will provide the name, email address and phone number of the General Contractor Project Manager & General Contractor Superintendent for your project. They will be sent a short survey in which they will rank your performance on a scale of 1-10 in the following categories below. The additional 50% of your score will come from a panel of 3 judges (architect, owner, and academia for example) who will review your application. They will base their score on your responses to the questions below as well. Your company has the opportunity to compete for honors in the construction industry’s premier annual awards program – the ASA Construction Awards competition – recognizing the outstanding general contractor projects of the year. Use this application and the included forms to enter your company’s best project(s). This submission is an easy 3-page electronic submission; no notebooks need to be created, and you will submit the information electronically. You may enter as many projects as you would like in any project size category. Projects must be completed by December 31, 2018. Your submissions are judged by a panel of three distinguished judges (architect, owner, and academia for example). They will be sent a short survey in which they will rank your performance on a scale of 1-10 in the following categories below. You must submit 6 photos to be included in the marketing material for the event, along with a 4 sentence summary. Pictures must include works in progress and completion photos. All entries may be submitted electronically to awards@asa-northtexas.org. Applicants will receive a video of the project for your own use, we will post video on our YouTube site. will review the submittals and winners will be announced at the Annual Awards Banquet. The cost to apply is $150. To promote ethical and equitable business practices, ASA recognizes those subcontractors that demonstrate the highest standards of internal and external integrity in the construction industry. The Excellence in Ethics Awards are granted annually based on corporate ethics policy and procedure, construction industry practices, and general business practices. Each applicant that completes the application and provides sufficient proof of exemplary ethics policies and practices in accordance with the judging criteria shall be recognized for the Excellence in Ethics Award, and may win an award at the annual awards banquet held on June 7, 2019. Applications are due to ASA no later than April 25, 2019. While this is a local award, you may submit the application to ASA National as we have the same criteria. The cost to apply is $250. More information can be found here.